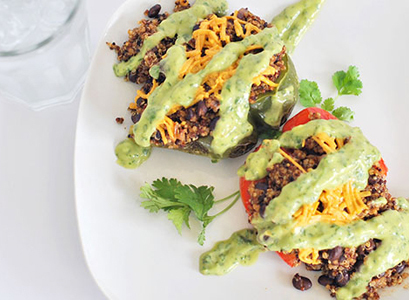 A delicious recipe for Stuffed Quinoa Peppers from Lauren Paints. Rub 3 bell peppers lightly with olive oil, roast that colorful rainbow of tasty on the top rack of the oven, stem up, at about 450 degrees for around 8 minutes. Turn peppers on side after 2-3 minutes and onto other side after another 2 minutes. Pull these out, set them aside to cool, and turn your oven down to 350 degrees. In a medium sauce pan, add 3 cups of water and 3 cups of vegetable broth, then submerge 2 bags of Success and bring to a nice boil. Once boiling, let cook for the recommended 10 minutes. 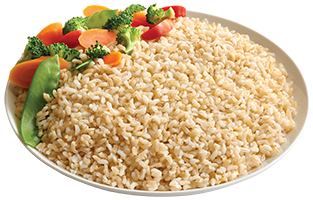 While your delicious quinoa is cooking, add 2 tbsp olive oil to a medium sized pan and sauté 1 cup of red onion until translucent. Turn heat to low and add the black bean, tomato paste, cumin, garlic, and chili powder, as well as black pepper and salt to taste! Stir occasionally until quinoa is finished cooking in broth. Next up, you'll need to start the avocado dressing. You'll begin by adding one avocado, cut into cubes, into a food processor, then add in cilantro, lime, scallions, garlic cloves, olive oil, water, and salt! Blend all together until smooth then refrigerate this tasty saucy goodness until later. Now, remove quinoa from broth with a fork! 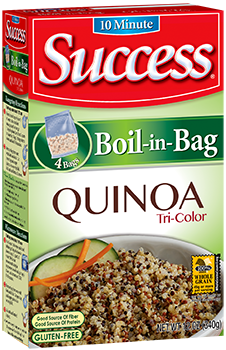 Cut the bag open and empty the quinoa into the pan with the seasoned black beans. Simmer with a lid on for 5 minutes to fuse flavors. Cut the stems off the peppers and clean out the seeds, now cut each pepper in half vertically. Lay pepper halves on their sides and stuff each with the tasty Success quinoa blend! Add vegan cheese and cook in oven on middle rack at 350 degrees for 7 minutes, or until melted.